It's a YouTube world. Video is becoming as ubiquitous in classrooms as laminated periodic tables and whiteboards. The use cases abound. The most popular use in K-12 right now is for the showing of video in classrooms (cited by 73 percent of respondents in a recent survey). That's followed by student assignments (58 percent), as supplementary lesson material (48 percent) and flipped classrooms (40 percent). But video is also gaining steam in teaching skills and recording students as they practice them (32 percent), in library media collections (31 percent) and recording school events for on-demand viewing. These examples aren't the only ones cited in the latest results of Kaltura's "The State of Video in Education." The 2017 survey, done in May and June 2017, drew responses from more than a thousand people, 11 percent of whom work in K–12 specifically vs. higher ed and other educational organizations. Most of the survey respondents hold one of four primary roles: instructional design, IT, faculty and media. Kaltura is a company that sells video products and services. Respondents report on their most common uses for video. Source: Kaltura's "The State of Video in Education." Why the push for video? Because the use of video increases student satisfaction with the learning experience (selected by 93 percent of overall respondents). Another 85 percent of survey participants said they believe video increases student achievement. Seventy percent mentioned that video improves graduate affiliation with the school. According to this year's results, the most popular "advanced feature" in use is for remote presentations. Fifty-four percent of respondents across all types of education organizations said that was in use in their schools. Nearly half (45 percent) reported the use of mobile apps for allowing viewers to watch video "on the go." A similar number reported using chapters to split lengthy videos into digestible segments. While closed captions have been picked up by just 39 percent of education organizations, an additional 52 percent said they would like to implement them. Even more respondents would like to add synchronized slides (cited by 61 percent) and in-video search (60 percent). While in-video quizzing has been adopted by just a quarter (26 percent) of respondents, 63 percent would like to implement that feature. 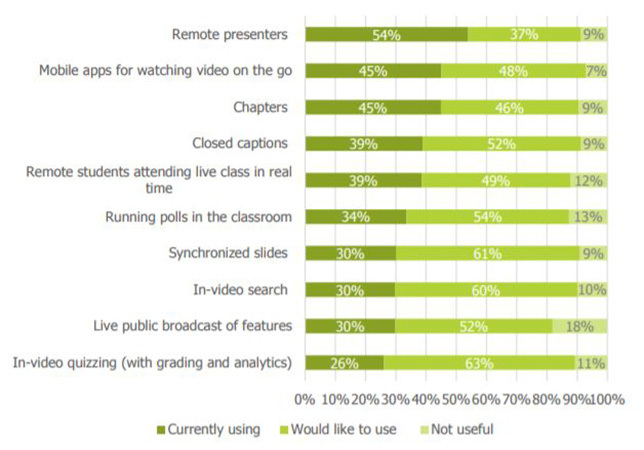 Respondents report on the "advanced features" in video that they're using or would like to use. Source: Kaltura's "The State of Video in Education." 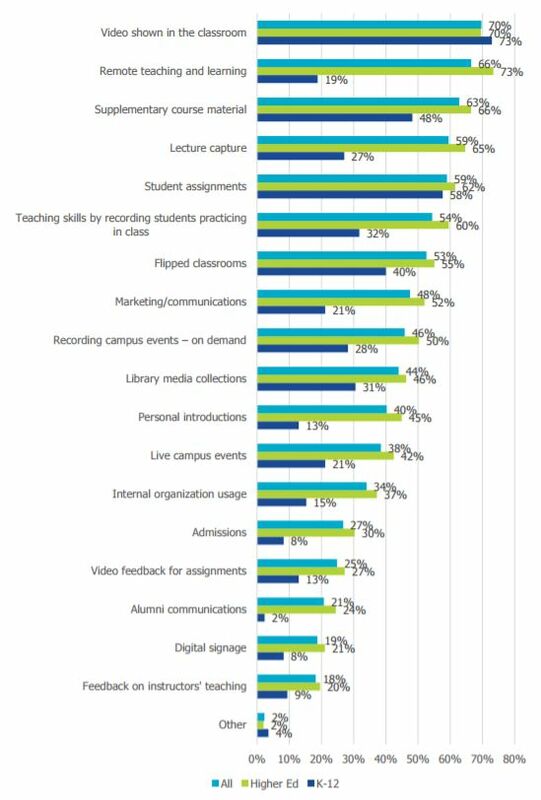 While most respondents said their teachers and faculty have access to at least some video tools and training, the flavor of the offerings varies widely across organizations. More than half make easy-to-use tools for video capture and simple workflows for publishing of videos available (54 percent and 51 percent, respectively). Yet far fewer schools have staff available to help with video creation and management (27 percent) or dedicated training on video technologies (32 percent). However, across the board all those categories have grown since last year's survey was published. As an example, in 2016 a third of respondents (32 percent) had a video solution that was integrated into the learning management system; this year 46 percent do. This year the survey added a question exploring what video tools and services students have available. Eighty-two percent of schools make equipment "fully" or "somewhat" available" to students. Similarly high numbers surfaced for student access to workflows for sharing videos (79 percent), access to video editing tools (76 percent) and training and support for use of video tools (74 percent). The self-selected respondents who filled in the survey are definitely sold on the value of video. "I think students learn more effectively when using video whether it be live or recorded," said one media/IT team person in a K–12 district. "Being a small, rural school, I see video as a huge benefit to us from a remote standpoint," added an administrator from another district. One respondent, a teacher, finds great value in lecture capture, which hasn't gained much traction at the K–12 level yet. "I think that the ability to record lecture sessions and allow students to consume the material at their own pace will drastically increase student engagement and can also decrease teacher burnout and attrition." Then there are the benefits of having students themselves create the video content and for schools to share video with their communities. As another K–12 teacher pointed out, "Students will continue to use their personal devices to record events that they are experiencing in the classroom — the recording of chloroplasts in the cells of water plants being viewed through a microscope, for example. Teachers are taking video of the happenings within their classrooms and sharing with [administration] or on Twitter, so I see video being used in conjunction with social media to promote student achievements and public relations." For the full report, visit the Kaltura website (registration required).